Aside from ‘built-in’ variables we also have the opportunity to define our own environment variables. Since they are bound to our environment they are great for things such as API access tokens. You could have a variable set to one value on your development machine and another in your production environment without having if-statements or special config files. Twilio’s helper libraries for example, look for the TWILIO_ACCOUNT_SID and TWILIO_AUTH_TOKEN environment variables if you instantiate a client without the two values. This way you don’t have to worry about accidentally pushing sensitive credentials to a place such as GitHub. Setting environment variables in Windows is pretty hidden in several layers of settings dialogs. 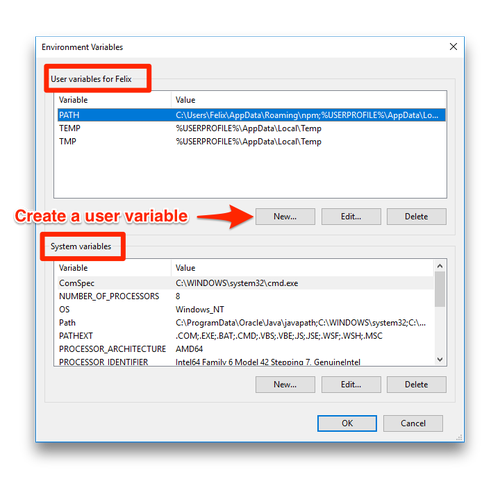 Just like most things in Windows, we will set environment variables using a graphical user interface. To open the respective interface you first have to open the Windows Run prompt. Do so by pressing the Windows and R key on your keyboard at the same time. 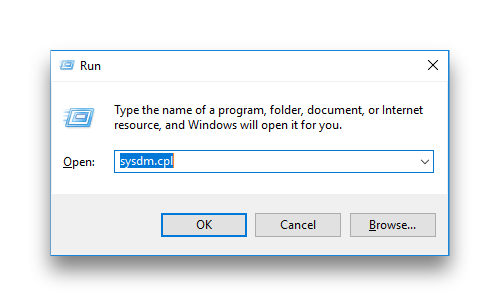 Type sysdm.cpl into the input field and hit Enter or press Ok. 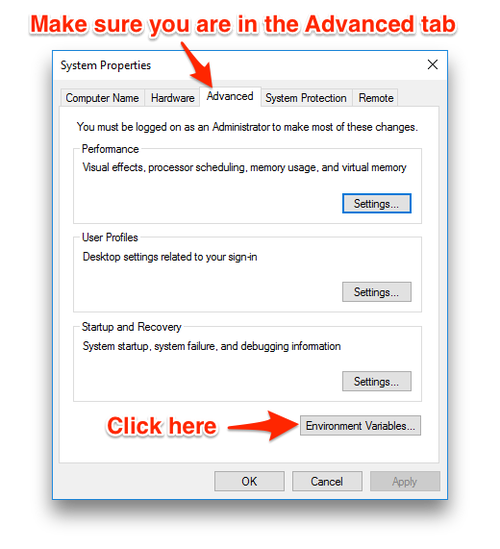 In the new window that opens, click on the Advanced tab and afterwards on the Environment Variables button in the bottom right of the window. The window has two different sections. One is the list of environment variables that are specific to your user. This means they aren’t available to the other users. The other section contains the system-wide variables that are shared across all users. Create a user specific variable by clicking the New button below the user-specific section. 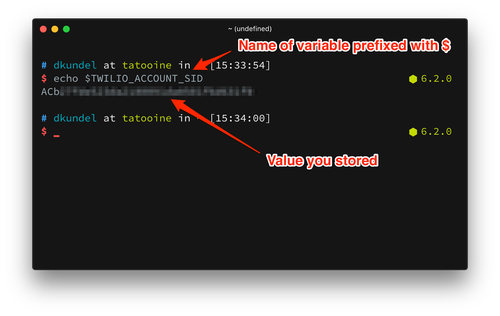 In the prompt you can now specify the name of your variable as well the value. 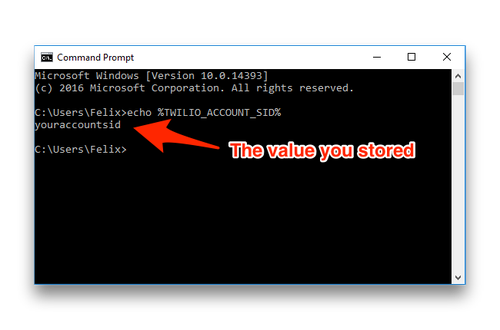 Create a new variable with the name TWILIO_ACCOUNT_SID and copy your Twilio Account SID from the Console. Press Ok in the prompt to create the variable, followed by Ok on the Environment Variables window. You are all set now. This should print the value that you saved in the environment variable. The end of the output should indicate which shell you are running. The typical shell is the bash shell which we will be using in this example. But the steps are similar for other shells like zsh or fish. You should see the value that you stored in it. In some situations you only need an environment variable set for only a single project. In that case .env files are a great solution. It’s a file inside your project in which you specify these environment variables and afterwards you use a library for your respective programming language to load the file which will dynamically define these variables. Since you most likely don’t want to commit your environment variables to a repository, make sure to add the .env file to your .gitignore to avoid accidentally pushing it. If you can’t find your cloud host among this list it doesn’t necessarily mean there is no way to configure environment variables. Make sure to check their documentation for more on it. That’s it! Now you can set environment variables which means that you can take all of your environment based configuration values out of your code and make your code more flexible and safe! Be mindful that these values are still stored in plain text. If you are planning to store very sensitive values you should look into something like a secret storage solution such as Vault. If you have any questions or would like to show me the awesome thing you are currently building, feel free to send me an email to: dkundel@twilio.com or contact me on Twitter @dkundel. I can’t wait to see what you build.